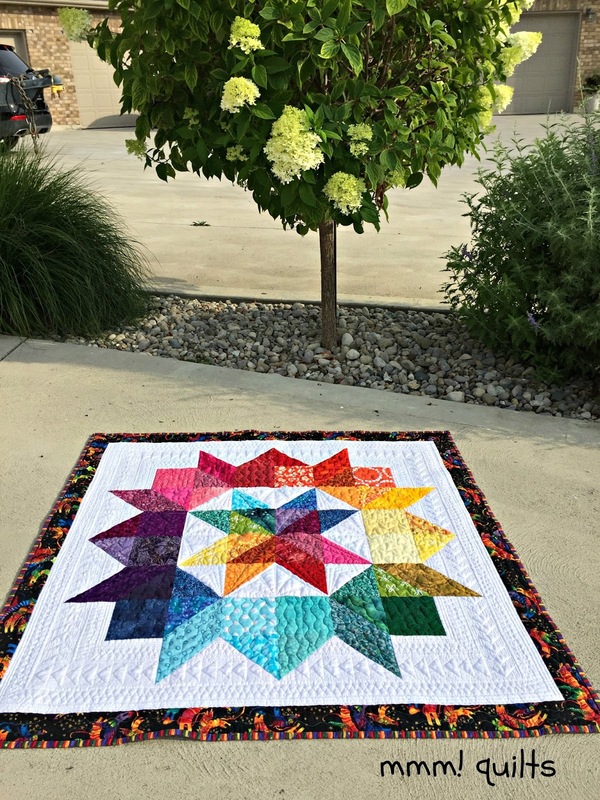 When I saw Ruth's Rainbow Rose QAL that she was doing at Modern Quilters Ireland, I immediately loved it. It is such a happy quilt and functional too, as a colourwheel. This is one of the projects on my Q3FAL List which you can find here. When I found the Laurel Burch backing, a chunk of fabric I have hoarded for oh, about a decade, but did use some on my Merry Cat-mas and Dayna's stocking, more angst set in because I wanted to put some of it on the front. To border or not to border? As you can see, the kitties won. They just had to leap and fly in their rows of 3 around the rainbow rose. Doing that meant I didn't have enough to cover the entire backing, but the purple cats print by Henry Glass worked perfectly. I did Angela Walters dot to dot designs with white Isacord polyester in the white triangles around the centre star. In the centre star I used a Judi Madsen design, one I've also used on Dayna's grad quilt that is fun to do. For this I used Aurifil variegated in rainbow colours. I did a random wavy line through the carpenter's wheel sections of the quilt using that same Aurifil thread. I am continually amazed at the difference in appearance from inside with natural light on a quilt, to outside in shade, to outside in fairly bright sunlight. The Legacy polyester batting I used is to die for. 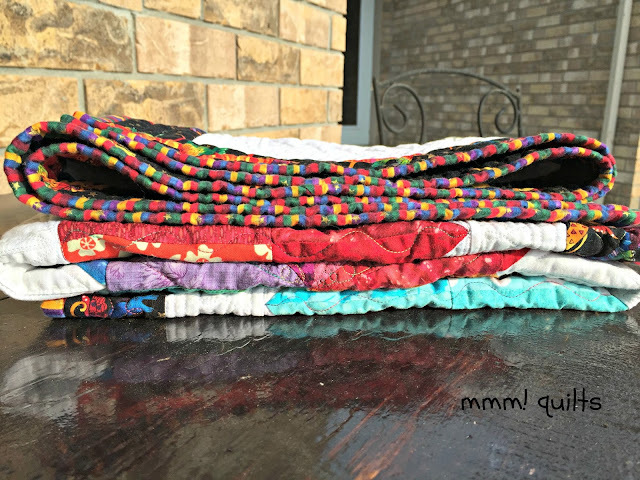 Quilts like butter, gives good definition and is light and airy. I first used this last summer in the guild wheelchair charity quilts. The charity quilt committee had been given a roll of it. I loved it. When I was in Alma Sue's Quilts in Sarasota this past winter, she had some quilt batting remnants and I scored two long and narrow pieces of it, one 17" the other 25" but by something like 84", for $2.50 for the two. Yes! So the batting in this quilt cost less than $2.50! There is a join about 2/3 over from one side. With this much quilting in the quilt I have no fear of it separating. In the kitties border I did a Christina Cameli design that I've now used at least three times, and I just love it: waves with three "e's" every so often. The binding I've had for quite some time. When I see a good stripe, I grab at least a half metre/yard since I love stripes as binding. In the white background around the wheel, you can see I did three different quilted border designs. Kathleen does this on lots of the quilts she quilts and I love the effects. 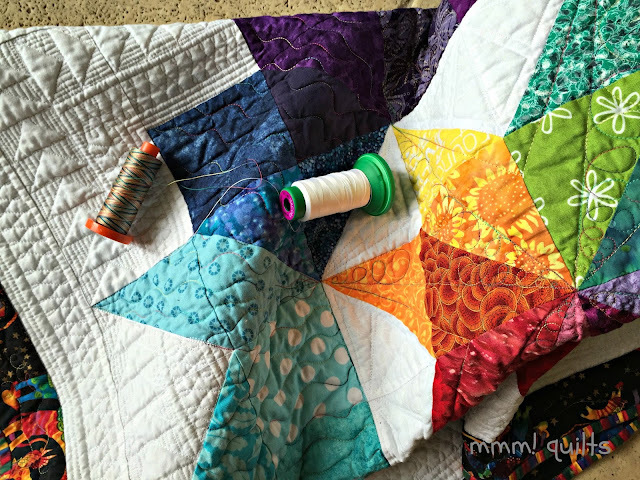 I love the idea of the quilting going behind the piecing. So I did skinny figure 8's, ghost geese, and figure 8's again. The white is not Kona Snow! It's Maywood Studio's Whisper Whites from Charlotte Sewing Studio. I've used this twice now, and it is a terrific fabric, doesn't fray as easily as the Kona either. Yes, I did my binding by machine again; it's just so much faster, and I am improving. Only had to go back in on 3 spots this time! Applying it to the front, folding it to the back, and stitching it down from the front in the ditch is my preferred method, and nicest final appearance IMHO. and also with Leanne at She Can Quilt for the Q3FAL. 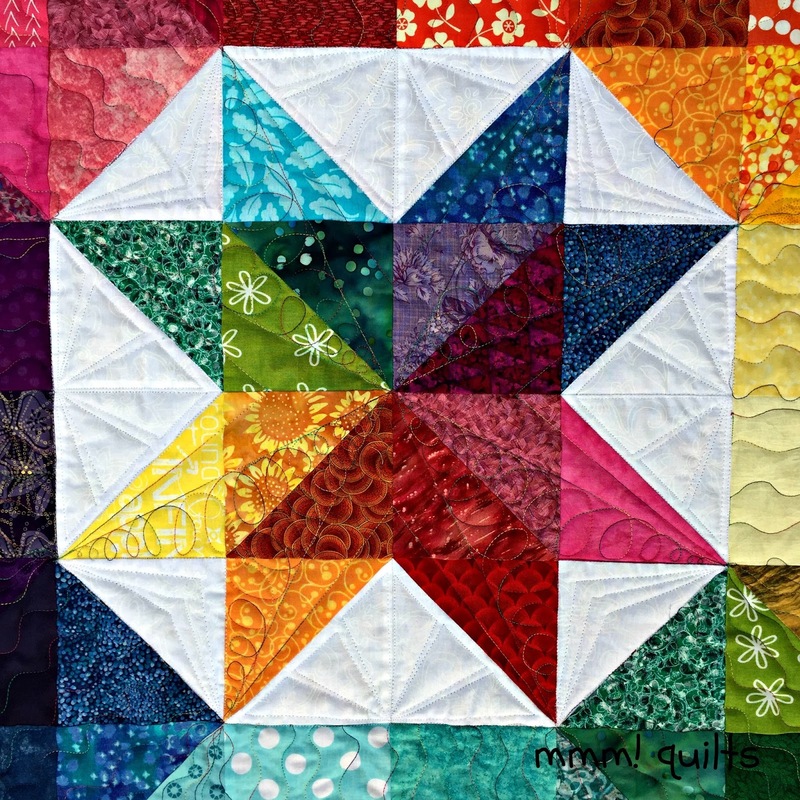 Just beautiful, love the colours, and your quilting skills are pretty amazing too!! I went back on the links and read about your earlier projects using that fabric - great stuff indeed! Beautiful! I really love the quilting you added into the negative space; especially those flying geese - they give it great movement. Quilting to suit every part of your quilt, superb colours, fantastic quilting, and an explanation beyond imagination, then the backing!!! and a photo shoot, guess you swept that pathway so clean beforehand. Sandra, this is such a gorgeous quilt! 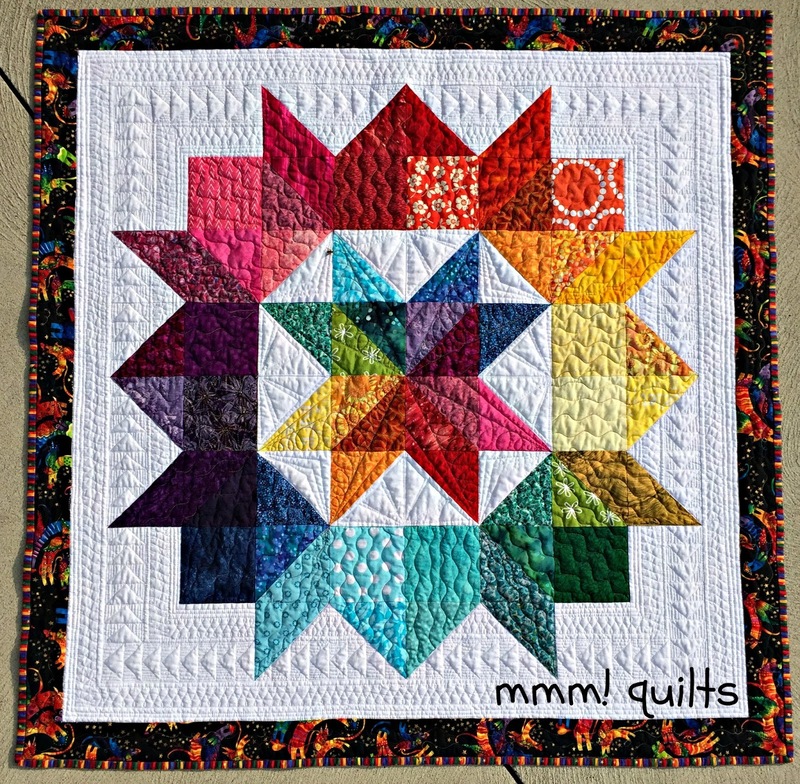 I am always so drawn to the rainbow layout in a qult - probably why I am enjoying the Rainbow Scrap Challenge this year. 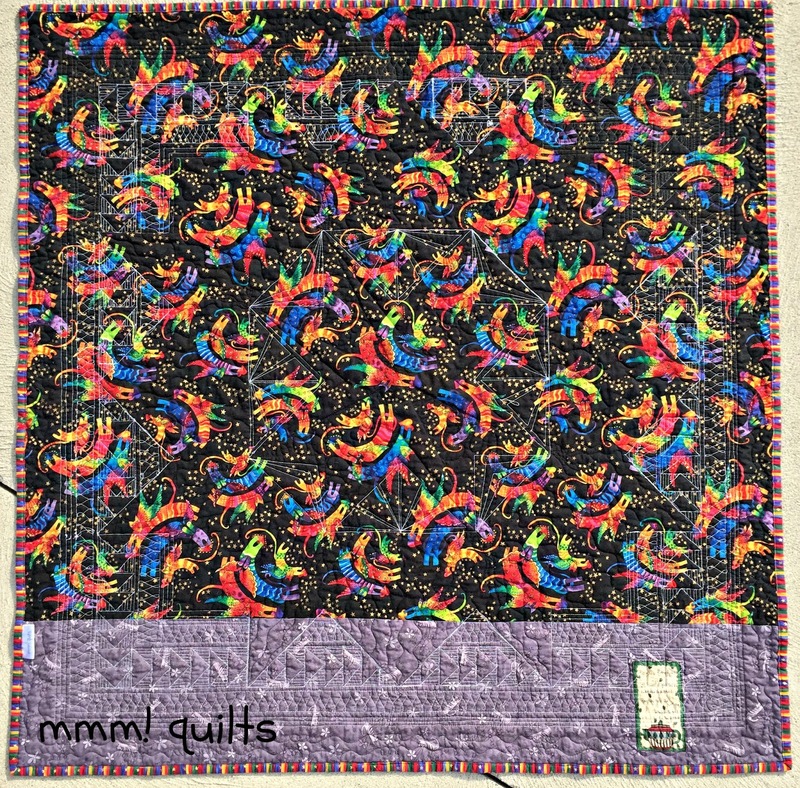 Your quilting is amazing and the rainbow cats for the border and backing are a hoot! What are you going to do with this quilt? Will you hang it in your house somewhere? Sandra, you keep outdoing yourself! Rainbow Kitty Rows is just glorious in every way! Every fabric you chose is perfect! Would you do anything differently if you had to do it over? I hope not! I imagine you smile each time you look at it, so I hope you keep it on display in your home. Wow! I do believe Laurel would be proud! Beautiful! That is a beautiful quilt - from the colours and piecing to the fantastic quilting, great job. It's a very striking finish Sandra. I love the dot to dot quilting you did in the sections in the middle of the two stars and love those wavy lines in the carpenter star as well....and of course you had to add animal life to your quilt. Benni would approve. I feel like I just keep repeating myself when I say "gorgeous" but it is!! Your wavy line looks a lot like the serpentine stitch I use on my machine (with a walking foot!) and that's about as close to FMQ as I get, lol. Who doesn't love Laurel Burch? I'm looking at all the detail on this quilting and find myself wondering 1) how long it takes you to do this on a quilt this size and 2) how many individual passes you have to make to do all the different patterns. Just not sure I'd ever have the patience but I sure love the results. Those kitties look like they are having so much fun romping around a great quilt. OMG!! The quilting on this is WOW! I lovee the ghost flying geese borders. Oh heck there's not anything I don't love about this piece. From the kitties borders to the quilting superb! It is beautiful. I love the cat border. The quilting is amazing. 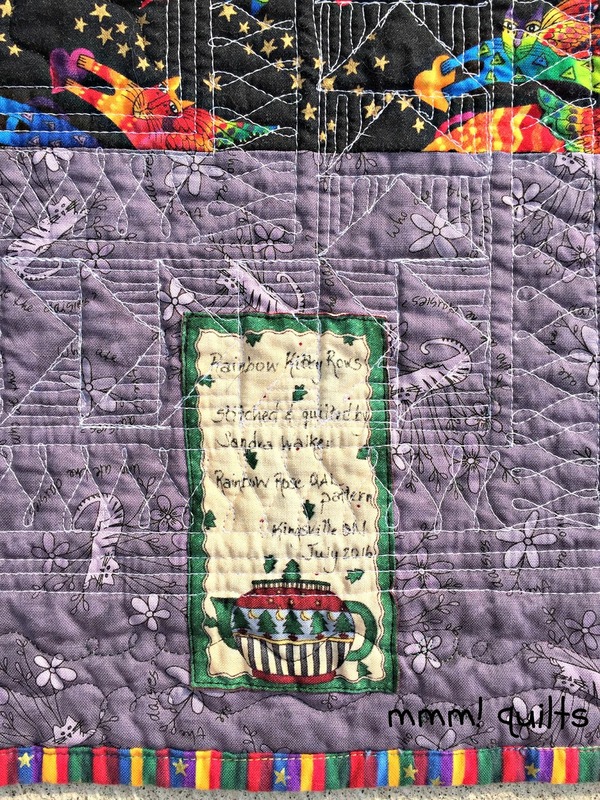 I'm thinking your nickname should be "The Divine Mrs. W" - because this quilting is divine Sandra! Wow it just knocks my socks off! And a person could not have found a better border and binding fabric. Those cats are purrfect! A wonderful Rainbow Rose finish! Something I almost never do is time myself. Not sure why maybe there's a subconscious "don't wanna know" going on! It DOES take a lot of passes, let's see there's the 'frame' as in the straight lines (which are FMQ too, but using a ruler) spaced at 2" apart for the geese, and then echoes on either side, then go back in and draw the straight line registration marks 1" apart so the geese are all the same size, 1X2", and then stitch those lines along with the diagonals to make each goose (ruler work here too) and then the back and forth matchstick quilting. Sometimes I did each side triangle 'wing' with matchstick as I completed each goose, sometimes I went back and did both sides of the column all at once. Then go over and echo the 2" long side edge if I hadn't already echoed, and fill in the 1" wide space with skinny figure 8's...the star is stitched in the ditch as is the wheel and the ditch between the kitty border and the white...I'm getting pretty good and confident with the ruler! The dot to dot designs in the centre are not nearly as labour intensive, some just 3 passes, and the more intricate ones, just 9 passes. Worth noting (and pat myself on the back here) is that I don't use the stitch regulator. 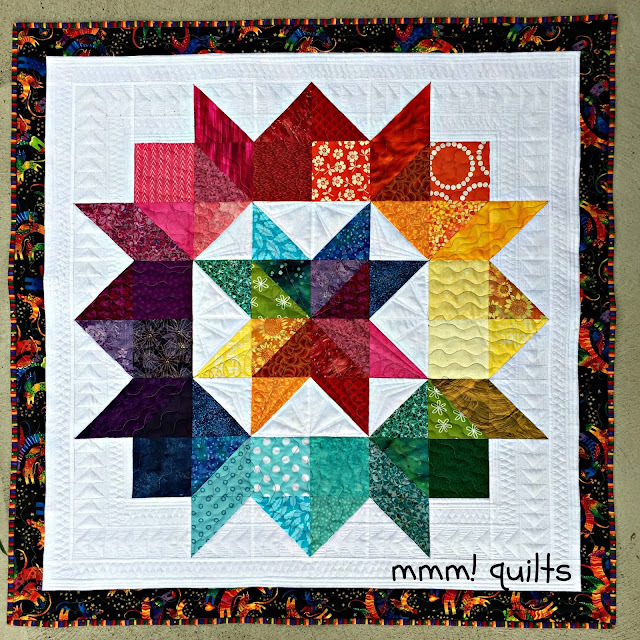 In my courses with Angela Walters, she always says not to, to try to flow, to get in the groove of the FMQ. So even though that causes me to whisper FML at times, it has made me a better quilter, IMHO. However, also worth noting is that I quilt on average at 50% speed, she quilts at 80%!! She is AHHH-mazing. Ah, that Laurel Burch fabric, absolutely gorgeous and so hard to decide where to use it! I had a piece once, think it went into a children's ward pillowcase, but who knows there might be a fragment lurking somewhere! I've really enjoyed seeing how everyone is quilting their Rainbow Rose, and yours is so very interesting. Almost like a sampler with all the techniques you used. Great finish! Oh my, I can only aspire to this kind of quilting. I love the beautiful texture--and those ghost geese just add so much! I love looking at how the quilt looks in different lights--your photos all show off the details so well! Great score on the Legacy batting! I'm going to keep that in mind. I love the feel of the quilts I've done handquilting on with polyester batting, but haven't tried machine quilting poly (except 80/20). It looks like the perfect combination of definition and drape. 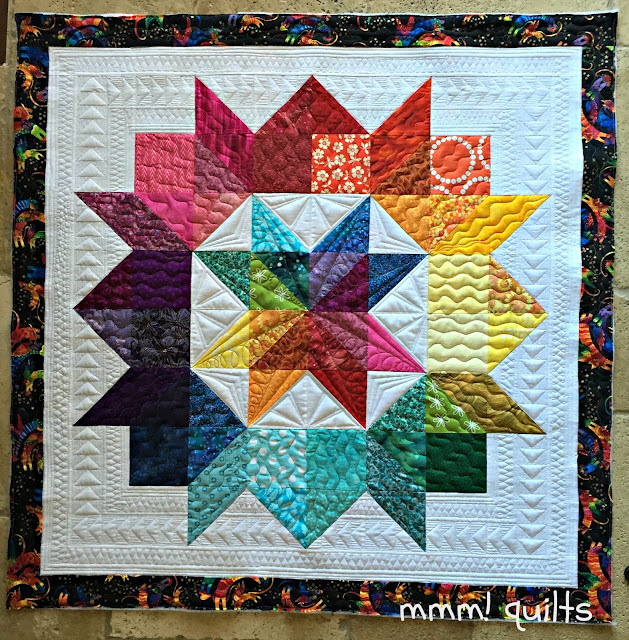 Such a wonderful quilting job for this! I really like the final border added on, and the way it frames the star-wheel. Who does't love a little Laurel Burch on their quilts? :D Nice addition to TGIFF - thanks for linking. Absolutely wonderful. I love the quilting and how you took a bit of inspiration from those amazing quilters-also my inspiration. I love the ghost geese that frame the star. I did chuckle when you added in the comments that you quilt at 50% whereas Angela goes at 80%-oh I would love to go at 80% but I'm with you for sure! It's beautiful! Absolutely stunning quilting, the most intricate it the link-up))) And the kitty fabric is to die for! What a gorgeous quilt! Your fabrics, colors and quilting are all exquisite! What a stunner! This quilt is gorgeous! I don't think I could handle 50% speed free-handing without a regulator! Marlene mentioned the ghost geese...I love them. Sometimes I forget that I can create a line or shape using this method. I should practice just a bit more. Wow, Sandra! Gorgeous quilting. 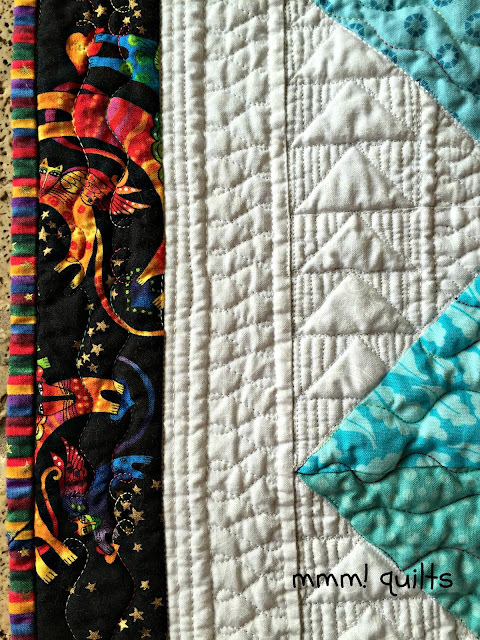 I never grow tired of admiring your quilting. Incredible!! Oh Sandra I love this!! The quilting is wonderful - love how all the different designs come together with such a great result. I really like the ghost geese and may borrow them - please? My top is still languishing as just a top without even a border added but seeing this has made me realise that I need to get it on the frame and quilted. Thanks for the inspiration! Oh my GOODNESS, are your SURE you're my sister?! The talent omg! Oooh I'm glad it feels as good as it looks cuz I tried feeling it on my phone - no go LOL. Wowza! Wow lovely, I like quilting too! Wow this is gorgeous! I love the quilting, especially the border of ghost geese! Those geese are gorgeous! If you were my neighbour I'd be dropping off mine for quilting and sitting there waiting for it! Absolutley lovely! Sandra, I LOVE what you decided to do with this quilt and the photography in "the morning sunshine" is beautiful. The border really enhances the colors of the star. I love everything about this!! Your quilting is incredible! Beautiful! 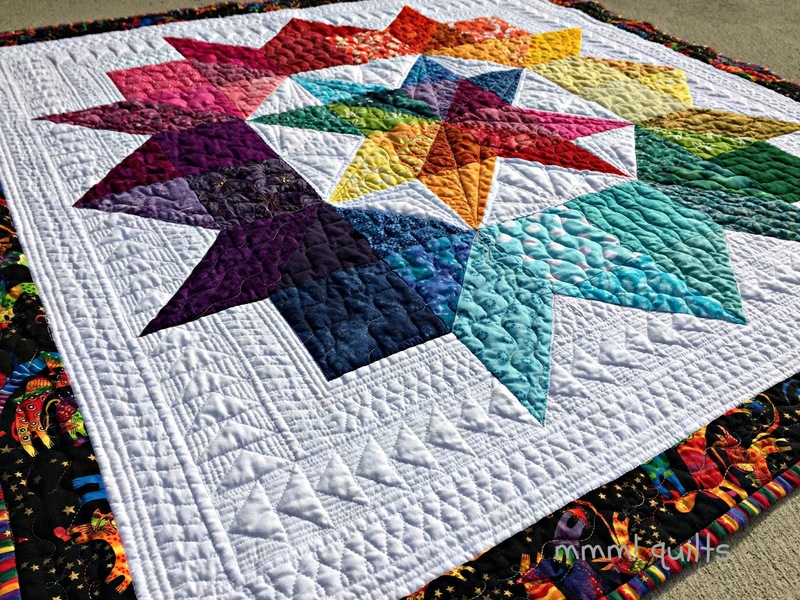 I love the design and the rainbow and the quilting is amazing!! Wow. The quilting is beautiful. This is beautiful and what a wonderful choice of colors!! I'm finally catching up on some blog reading. :) This turned out amazing! Your quilting is stunning, very inspiring! It is a lovely quilt. Thank you for participating in the FAL, on behalf of the 2016 global FAL hosts. This is beautiful! I like the darker border, but it's that rainbow rose that hogs the spotlight. Exquisite! Love the color-wheel effect. Love the gorgeous quilting of the negative space. Really nice one.